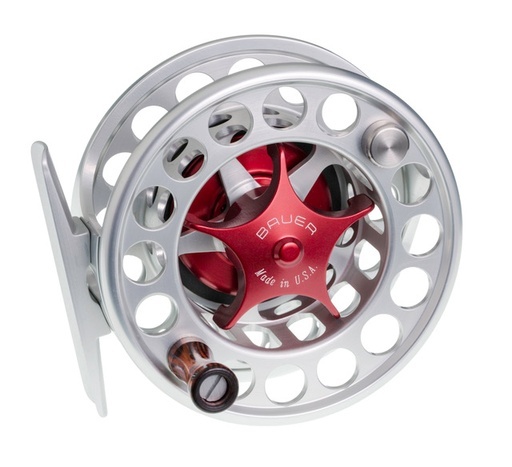 Introducing the Bauer SST fly reel. Featuring a striking narrow profile frame design, the SST offers exceptional large arbor performance, our proven carbon fiber drag system, star drag knob operation and a wide variety of color options. As with all our reels, the SST is precision- machined and built to meet the requirements of the most demanding anglers and angling situations. An extraordinary new reel for 2 through 9wt lines. All SST reels come standard either in Clear Anodized Aluminum with choice of star colors in Red, Blue, Green, Gold, Black or Clear Aluminum or in all Black. Red hub is standard. For Clear Anodized Aluminum Reels choose either Light Blue or Pink, available with an additional $25 upcharge. Gold, Blue, and Clear Aluminum are available with an additional $25 charge. For the new SST, Bauer has simplified the naming protocol for each reel. Example: SST 4 is ideal for a 4wt line. However, each SST can be used with lines one size smaller or larger depending on the user’s preference.